then they suggested this part be installed to fix the camber. 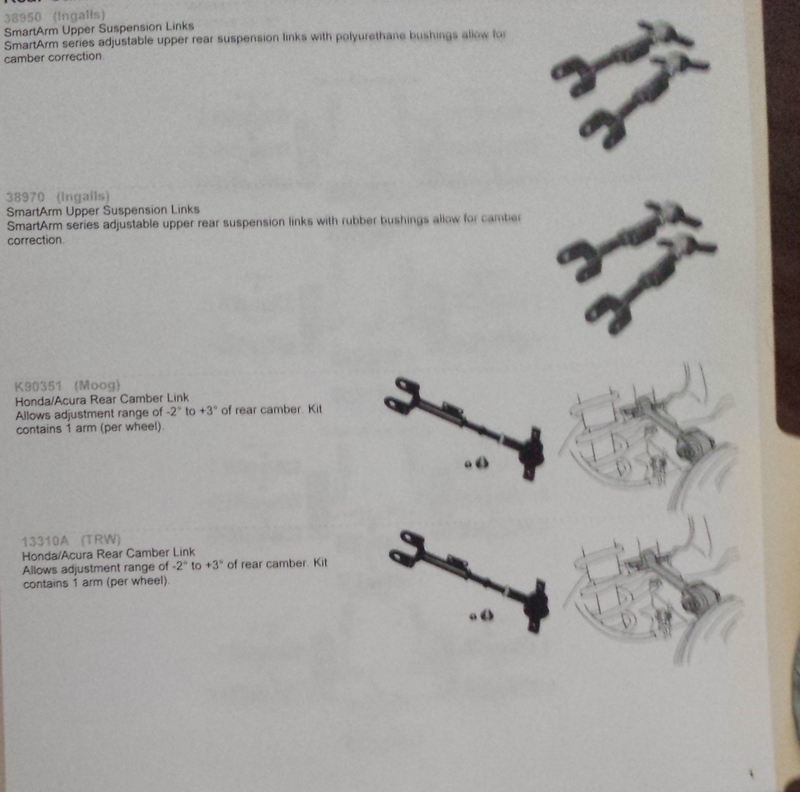 Was the alignment done properly? Do I need that part? The "before" picture tells why the tires were wearing bad. Should have eaten off the inside edges of the tread. Probably drove a little squirrelly too? 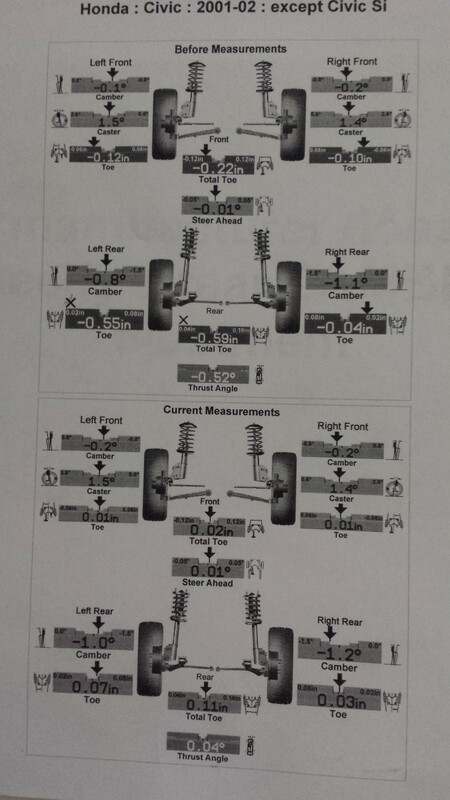 Current alignment numbers look good..... with the exception of the left rear. I personally like to see the toe match the opposite side and hit the desired spec target on the nose, but I'm just nit-picky like that. It's close enough it should not matter much, and it is within the acceptable spec range. unless rear camber is a problem. Got super wide tires or anything? Lowered? Last edited by ezone; 04-23-2015 at 06:12 PM. Reason: Read it again, because I like to edit while you are reading. It's the same tires and rims as before. (215 45 17) No lowering. I just got new tires for the front and kept the rear tires. And yes they do have inside wear. Should I go back and ask them to increase the right rear toe? They did say the parts were Honda's way to make more money. They weren't too pushy about it. HAHA I was editing while you were reading LOL ( I changed it to left). A little wider than stock, so they can show unusual wear quicker than stock. You can run them a while..... .Keep in mind that what's already worn off cannot be 'brought back'. They will continue to look crappy on the inner edges and will go bald or show steel cords there first. If they still eat the inboard edges, then sure go for changing to the adjustable arms and doing the alignment again. This week I've kinda been dealing with the same thing on my 12, running 225-40-18 and starting to wear the inside edges of the freekin $$$ tires. The rear cambers on mine were at about a full degree negative..... I removed my rear upper arms and used a die grinder to open up some room for adjustment. Now I got them adjusted to about -0.5* and -0.6*, and I still want to get them even closer to 0*. I refuse to spend a damn dime to solve my problem LOL. I don't drive it hard at all so I'm not looking for high performance alignment, I just want them to wear evenly. Ok Thank you. I'll keep on eye out for the wear patterns. How safe is a tire with a plugged shoulder?